Sympathy flowers and sympathy plants are traditionally sent to the funeral home, church or mortuary once the news of the loss has been announced. Most funeral homes, churches and mortuaries have a “wake,” “visitation” or “viewing” where friends, family and associates come to pay their respects to the family. Proper sympathy flower etiquette is to send flowers or plants to the funeral home, church or mortuary prior to the first visitation hours. If you are late in sending flowers and can not have flowers arrive in time for the first visitation it is still appropriate to send flowers as long as they arrive prior to any additional visitations. If you have not sent flowers in time for them to arrive prior to the last visitation you may want to consider sending flowers or a plant to the family of the deceased at their residence. Some people insist upon sending last minute flower orders to the funeral home, church or mortuary and some people insist upon having last minute flower deliveries made directly to the graveside service. This is not considered proper etiquette as it is very disruptive and inconsiderate to have flower deliveries arriving during the service. 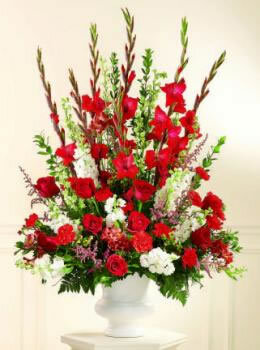 In many instances, last minute flower orders are lost in the commotion of moving the flowers from the funeral home, church or mortuary to the graveside service and in other instances funeral directors will not accept last minute flower deliveries in attempt to avoid the negative events mentioned above. If you have missed the visitations and the funeral service it is considered very proper etiquette to send flowers or a plant to the family of the deceased at their residence. In fact, it is considered appropriate etiquette to send flowers or plants to the family of the deceased up to a month after the funeral service. Some people even prefer to send flowers and plants at a later date because it is a great way to let the family of the deceased know that people are still thinking of them even after the funeral service has passed. Many people who have lost a loved one find this very comforting.